Treasure reference number: 2007 T252. 8 silver hammered pennies and 2 silver cut half pennies were discovered in an undefined but ‘relatively small’ area according to the finder. The earliest coin is a cut half penny of Henry II and the latest is a silver halfpenny of Henry IV. The majority of the coins fall between these two dates and represent Henry III, Edward I and Edward III. All coins present are official English issues of the mid and late medieval period and will thus consist of silver of the sterling standard, i.e. 92.5% fine metal. Two of the Henry III pennies were discovered just 3 inches apart, however, the likelihood is that they do not represent a single deposit. The character of the material suggests a site where a degree of coin loss over the mid and later medieval period was likely. 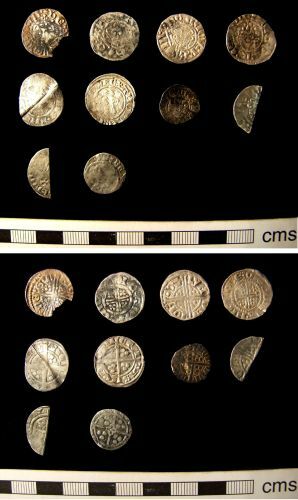 The 13th century is the medieval period most productive of single coin losses in England, hence the proportion of coins of the Short Cross (1180-1247), Long Cross (1247-1279) and Edwardian period (1279 onwards) – each of these coinages was the result of a complete recoinage of the previous type, and they did not mix in currency. There would be no compelling case for regarding the physical proximity of any of these items in the group as anything other than accidental. Therefore, there does not seem to be a case for regarding any of the coins as representing Treasure under the terms of the Act. 1. Henry III, Class 3ab (1248-50), Moneyer: Roger, Mint: Gloucester Obverse: Crowned facing bust. Crown figure 1, two curls to either side of head, no neck lines. HENRICVS REX III’ Reverse: Voided long cross, three pellets in angles. ROG/ER O/N G[ ] 2. Henry III, Class 7a (1217-1222), Moneyer: Simon, Mint: Canterbury Obverse: Crowned facing bust, two curls to either side of head, prominent pellet on chin, sceptre in right hand; hand dividing the legend R/EX thus. HENRICVS R/EX Reverse: Voided short cross, quatrefoils in angles. SIMON ON CANT 3. Henry III, Class 5c (1251-1272). Moneyer: Iohan, mint: London Obverse: Crowned facing bust, sceptre in right hand, crown as figure 5, X as figure 15. HENRICVS REX III’ Reverse: Voided long cross, three pellets in angles. IOH’/SON/LVNDEN 4. Henry III, Class 8b (c. 1242-1247). Moneyer: Nicole, mint: Canterbury Obverse: Crowned facing bust, sceptre in right hand, pellet in curls, pellet on chin, pellet stops between lettering. HENRICVS REX Reverse: Voided short cross, quatrefoil in angles, pellet stops between lettering. NICOLE ON CANT 5. Edward I, Class 9b? (c. 1299-1300/1). Mint: York – Royal Obverse: Crowned facing bust. [EDWARD] REX DNS HYB Reverse: Long cross, three pellets in angles, CIVITAS EBORACI 6. Edward I, Class 1c (May to Dec. 1279). Mint: London Obverse: Crowned facing bust. EDW REX ANGL DNS HYB. ‘N’ reversed. Reverse: Long cross, three pellets in angles, CIVITAS LONDON 7. Edward III, North number 1131. (1344-1351). Mint: London Obverse: Crowned facing bust. EDWARDVS REX. Reverse: Long cross, three pellets in angles. CIVITAS LONDON 8. Henry III, Cut half penny, Class 5 (1251-1272) Mint: ?Canterbury Obverse: Crowned facing bust, sceptre in right hand. H[ENRICVS R]EX III Reverse: Voided long cross, three pellets in angles. WIL[LEM ON CANT]OR 9. Henry II, Cut half penny, cross and crosslets type (1158-1180) Obverse: Sceptre head visible. HE[ ] Reverse: Short cross, crosslet in angles. Illegible. 10. Henry IV (1399-1413) Half penny. Obverse: Crowned facing bust. Double saltire stops. [HENRI]CVS REX. Reverse: Long cross, three pellets in angles, quatrefoil in centre. CIVITAS EBORACI.